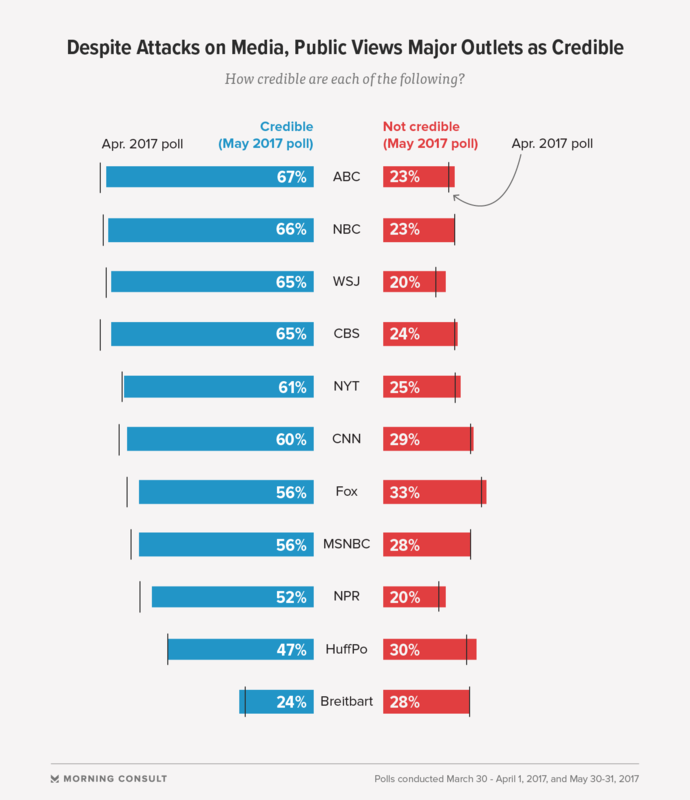 After a brief bump in viewer trust between December and April, cable news’ credibility among the general public is back to where it was late last year, a recent Morning Consult poll shows. But as a whole, Americans still believe the major networks to be credible, even as members of the media are finding themselves in defense mode — sometimes literally. More than half (56 percent) of people say they consider Fox News credible, according to the poll, which was conducted during the final two days of May. That’s a four-percentage-point drop from April, when 60 percent of people said they trusted Fox News. In December, 55 percent of people said they considered Fox News a reliable media outlet. Even among Republicans, who often prefer Fox News to other outlets, credibility for the network fell three percentage points to 72 percent. Similarly, trust in MSNBC dropped from 59 percent in April to 56 percent at the end of last month, within the margin of error compared to figures in December. And the channel’s support slipped 4 percentage points among Democrats in the latest poll, to 70 percent. CNN also fell three percentage points to 60 percent, the same level as in December. The network continues to see a partisan bias among its viewers, with 76 percent of Democrats saying they trust CNN, while 45 percent of Republicans say the same thing. Both groups notched a drop in credibility compared to figures in April. Other news organizations included in the poll, such as ABC, NBC and the Wall Street Journal, did not show a percentage point change outside the survey’s margin of error, which is plus or minus 2 percentage points. The press has found itself under attack recently. In one of the most high-profile incidents, Ben Jacobs, a reporter for The Guardian, tweeted from Montana in late May about his alleged assault by then-House candidate Greg Gianforte, who ultimately won the election to fill now-Interior Secretary Ryan Zinke’s seat. While some voters cheered the attack, public opinion across the country as a whole has shown voters are shifting their trust toward the political media, and away from the White House and its anti-media rhetoric. That’s according to a separate Morning Consult/POLITICO poll conducted in mid-May. Gregory Martin, assistant professor of political science at Emory University who has written about cable news bias, said that because many Americans don’t actually watch cable news, they are likely basing their opinion of channels such as CNN or Fox News not on the network’s programming and content, but instead on what they see in their social feeds or on other means of media consumption. Cable ratings also took a hit after the election, he added. In some cases, people’s perceptions are affected by the negative news they hear about a network, Martin said. For example, in April, former Fox News prime-time host Bill O’Reilly was fired in the wake of a sexual harassment scandal. In the aftermath, viewers said they would continue to follow O’Reilley but considered 21st Century Fox’s move to cut ties the right call. More recently, headlines about Fox News focused on network personality Sean Hannity’s pursuit of a story debunked by other media outlets about the murder of a Democratic National Committee staffer. A Fox News representative did not respond to a request for comment. Polling was conducted May 30-31 among 2,201 adults. See the full results here.